Hurricane Creek is a great place for turkey hunting. We offer a fully guided hunt with some of the best callers in the south, or you can try your own skills at luring in that mature Tom. Our turkey flocks have really flourished over the past few years. It is not unusual to hear the woods come alive at daylight with the sound of numerous gobbling Toms looking for true love. Our turkey flocks are thriving due to our continuous effort to eliminate the predators like coyotes, bobcats and raccoons. 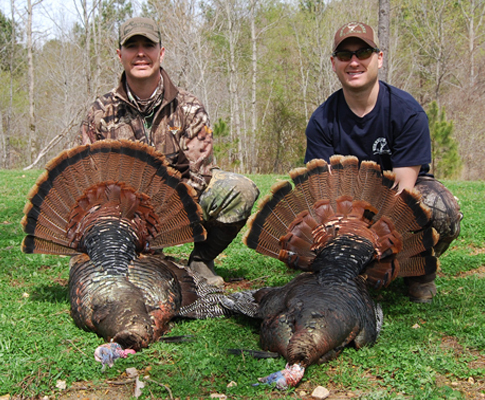 Our land offers some of Alabama’s best Turkey hunting. Turkey season in our area opens April 1st and runs through April 30th. Alabama law allows one Tom per day with a limit of 5 in a season. There is no fee regardless of how many birds you kill. This is a very short season, and we are sure to book up fast. Contact Us to arrange your hunt, and we promise the same attention to detail we’re known for. Up to TWO Toms! One-on-One Guide Service Included. You can also see more info on what to bring by visiting the “FAQ” page.